Today’s children are less healthy than they were a generation ago, and science shows that pesticides are contributing to the trend. This is the core finding of a new report from Pesticide Action Network, A Generation in Jeopardy. As a mom I find this report both profoundly disturbing and deeply motivating. As one of the report co-authors, I’m hoping A Generation in Jeopardy will jumpstart a long overdue national conversation about how pesticides are undermining our children’s health and intelligence — and how we can do better. Our team of scientists at PAN reviewed more than 200 recent studies exploring how pesticides are linked to a range of childhood health harms. 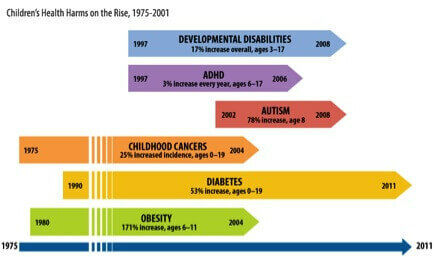 We also looked at government data tracking the trends in these diseases and disorders. From learning disabilities, ADHD and autism to childhood cancers, early puberty and more, many childhood diseases are on the rise, and a growing body of evidence points to pesticide exposure as a significant contributor. 400,000-600,000 of the 4 million children born in the U.S. each year are affected by some sort of developmental disability. This is up 17% in the past 15 years, and public health experts are raising the alarm about a “silent pandemic” of learning disabilities and disorders undermining the potential of an entire generation of children. The science linking exposure to neurotoxic pesticides to harm of the developing brain and nervous system is especially strong. More than 10,000 children are now diagnosed with cancer every year, and incidence of leukemia and childhood brain tumors, the two most common types of childhood cancer, have risen 40% and 50%, respectively since 1975. Studies suggest that exposure to pesticides during pregnancy and early childhood is contributing to this trend. Today, more than 7 million U.S. children are affected by asthma, up from an estimated 2 million in 1980. Emerging science points to pesticides as a possible contributing factor. To be clear, pesticides are not the only driver of these health harms. Scientists agree there are many factors at play, and that there is often a combination of genetics and environmental contaminants involved. Image source: See the report A Generation in Jeopardy for a full list of citations.